Do you ever find it hard to get your layouts exactly in the right place down to the 64th of an inch. Or maybe you are having trouble marking 47.5 degrees. 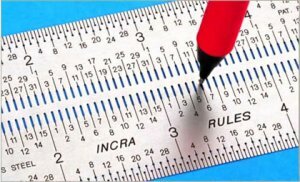 If you are having problems with your layouts, you might be in need of one or more of these super cool rules from Incra. They are precision made stainless steel rules with micro-fine holes for making highly accurate marks or lines. Simply find the correct hole or slot for the measurement you are looking for, and mark away. The holes are designed to fit .5mm pencil lead. Incra has a variety of marking Rules that are sure to fit your needs.